TOPELE 3.6A Dual USB Charger Wall Outlet These USB charging devices are designed to power up your iPhone, iPad, e-reader more quickly and reliably, it works without the need of bulky AC adapters . Charge one device or multiple devices from a single USB receptacle. Feature ? Charge 2 devices simultaneously while using receptacles as well ? Compatible with USB 2.0 & 3.0 compatible devices. ? Total charging capacity of 3.6A. ? Back and side wire terminals accommodate #14 AWG - #12 AWG standard and solid copper wire for installation flexibility. ? 2 free wal plates, includes screwless Wall Plate and standard wall plate Common Issues The screws can not be tightened -When you get the usb receptacle, the screws are untightened. Just tighten the screw clockwise. Please follow the installation guide. It can work without Ground Wire? -this USB outlet can work without Ground wire. But for your safety, We recommend you to use a ground wire or consult an electrician What different with Adapter's "Fast Charging" and outlet's "fast charging"? Some phones support "fast charging function" with adapter. it's not same for USB outlet. The adapter's "fast charging function" will bring very high heat. 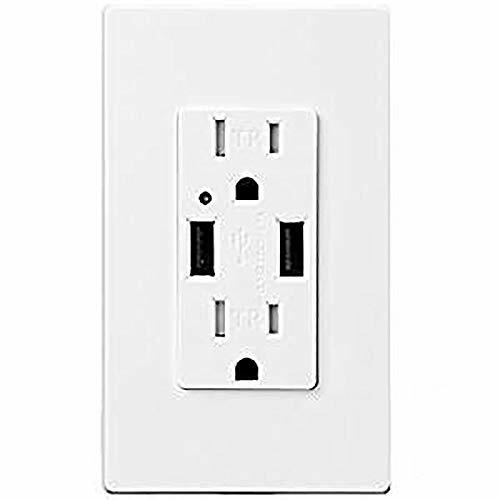 USB Outlet would be installed in the wall, so we desgined total of 3.6 Amp capacity. Both two USB charging ports deliver the optimum power to charge the devices at their highest charging efficiency. How to install 1.Push the screw lightly into the hole on the left side, Preliminary fasten the screw. 2.Insert the wire through the little hole on the top. 3.Tighten the screw CLOCKWISE.DO NOT TIGHTEN IT ANTICLOCKWISE! If tighten it in a wrong way once a time, the screw won't be tightened anyway.